FORT HOOD, Texas - The Fort Hood soldier suspected of killing three people and wounding 16 others last week began his eight-minute rampage on the sprawling Texas Army post after an argument related to taking leave, military investigators said Monday. 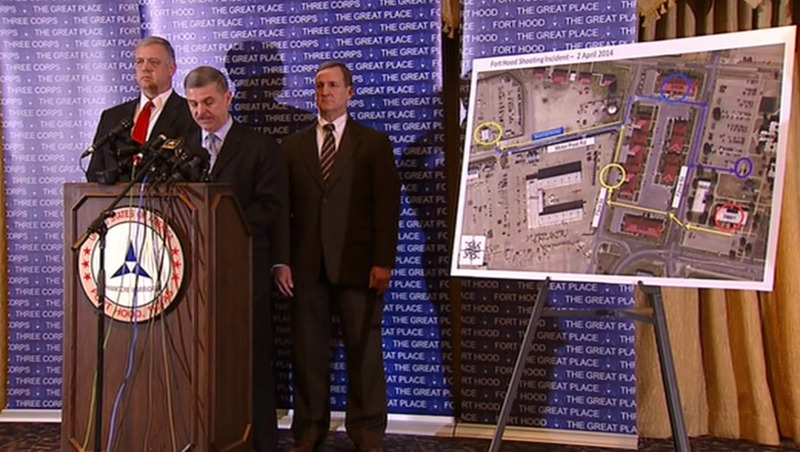 Army spokesman Chris Grey didn't indicate during a brief news conference whether Spc. Ivan Lopez was granted the leave or the circumstances behind the request. The shooting spree Wednesday ended when Lopez killed himself with his .45-caliber pistol after confronting a military policewoman, who Grey said fired once at Lopez but didn't strike him. A spokesman for Lopez's family said last week that Lopez was upset he was granted only a 24-hour leave to attend his mother's funeral in November. That leave was then extended to two days. Providing the most detail yet about the second mass shooting at Fort Hood in five years, Grey mapped out how Lopez opened fire in the building where the argument began before leaving and driving away, shooting at times from his car. The three who died were gunned down in separate locations. The rampage covered the equivalent of two city blocks. Grey said Lopez killed one soldier and wounded 10 other in the first building - and that the victim there included one of the men Lopez had argued with moments earlier. Lopez then drove to a motor pool area where the Army truck driver was assigned and worked, killing another, Grey said. The last place Lopez entered was a block away at a medical building, Grey said, walking inside and killing a soldier behind the desk. "At this point we do not know why he entered that building, and we may never know why," Grey said. In all, investigators say Lopez fired more than 35 shots. Authorities said 11 of 16 injured have returned to duty. Three soldiers who remain at nearby Scott & White Hospital, where the most critically injured were taken, were listed in fair condition Monday. President Barack Obama is scheduled to attend a memorial service Wednesday at Fort Hood. The slain soldiers have been identified as Sgt. Timothy Owens, 37, of Effingham, Ill., an Iraq war veteran; Staff Sgt. Carlos A. Lazaney-Rodriguez, 38, of Aguadilla, Puerto Rico, a 20-year Army veteran who was planning to retire; and Sgt. 1st Class Danny Ferguson, 39, of Mulberry, Fla., a Bronze Star winner who had just returned from a deployment to Afghanistan. In another attack at the base in 2009, 13 people were killed by Army psychiatrist Nidal Hasan, who had said he was angry about being deployed to Afghanistan and wanted to protect Islamic and Taliban leaders from U.S. troops. Lopez did a short stint in Iraq in 2011 and told medical personnel he had suffered a traumatic brain injury. The 34-year-old was undergoing treatment for depression and anxiety while being evaluated for post-traumatic stress disorder, base officials said. Fort Hood officials on Friday, however, said his mental condition was not a "direct participating factor" in the shooting. But officials said Lopez did not see any combat in Iraq and had not previously demonstrated a risk of violence. He seemed to have a clean record and Grey said again Wednesday that Lopez showed no ties to potential terrorists.